Comet ISON is on way to have a close encounter with solar system star the Sun in coming days in November 2013. Comet ISON is expected to pass as close as 1 million km from the Sun this month. Comet ISON is highly expected to face evaporation threat during the close encounter with Sun. Comet ISON is visible from the Earth with small telescope for it's large tail away from the Sun. Comet ISON to face 5000 degrees of temperature at the Sun. Comet ISON survival might reveal about it's surface and composition in coming days. Comet ISON may loose it's tail after the encounter from the Sun. 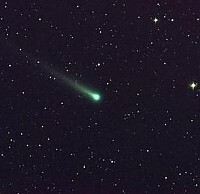 Comet ISON will be on it's trajectory in December 2013 passing through the Earth. Comet ISON does not have chance to make any impact with the Earth. It will return back to Oort cloud sitting on the outer ring of the solar system.